Volvo, the Swedish carmaker that is now owned by a Chinese company, is known for making safe and sensible vehicles, but one does not associate stylish vehicles with it. That is not until now. Volvo's latest introduction, the new S90, is a stylish and sporty sedan which has a very pleasing and distinctive Scandinavian design. Along with the iconic Volvo P1800 made from 1961 to 1973, the new S90 is arguably the best looking Volvo to date. The new S90, which we sampled in Spain recently, will replace the S80, but there is very little in common with them. 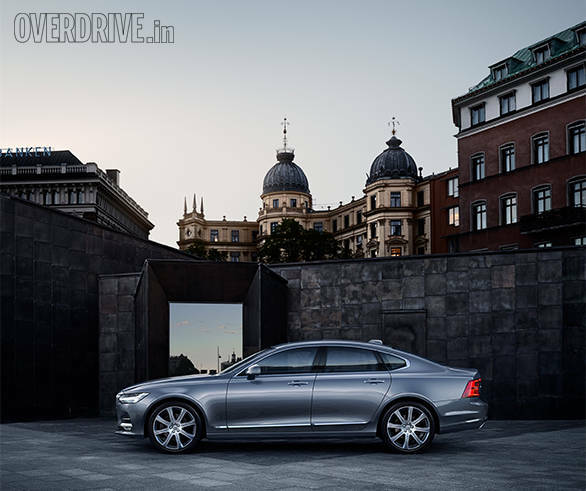 While the S80 is your typical Volvo with understated boxy styling focusing on safety, space, practicality etc., the S90 is a refreshingly different kind of Volvo. No it's not devoid of its old values of safety and the like, but it also has a sense of style, flair and luxury, the kind of which has seldom been seen in a Volvo. The new S90 is based on Volvo's recently introduced highly flexible Scalable Platform Architecture (SPA). This is also the platform for the highly appreciated and innovative Volvo XC90 crossover. With this platform, Volvo can make vehicles that have common components and manufacturing processes but have different wheelbases and front and rear overhangs. Of course, overall height etc. can also be different. So while the S90 shares its platform with the XC90, it looks completely different. It has clean flowing lines with a sleek profile and balanced proportions. 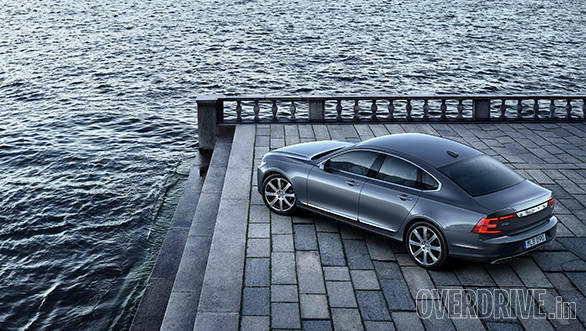 The S90's classy stance and sharply sloping roof give it an almost coupe-like profile. The shape and styling is complimented by the long, wide and bold front grille with concave vertical elements. 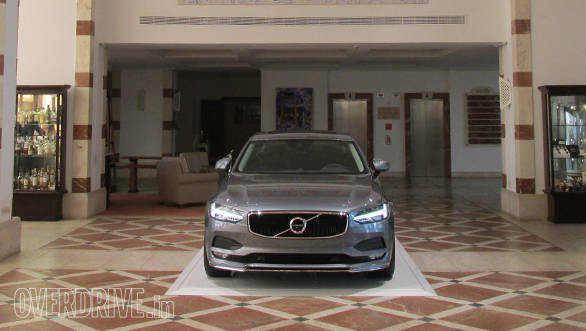 It is flanked by narrow and long headlamps that highlight the S90's width. The S90 is actually quite a big car. Its overall length is 4,963mm, much more than its rivals like the BMW 5 Series (4,907mm), Mercedes-Benz E-Class (4,879mm) and Jaguar XF (4,961mm). Photographs don't do the S90 justice, and it looks much better and longer in the flesh. While it may be a big car, it's powered only by 4-cylinder engines. Interestingly, all the 4-cylinder engines have a cubic capacity of less than 2.0 litres, which means Volvo's can be sold in Delhi and wherever else diesel engines over 2.0 litres are banned. 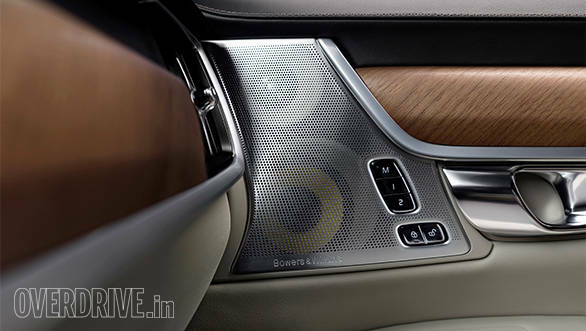 The interior of the S90 is similar to that of the XC90, which means it's as luxurious and stylish. Luxury cars generally have very well-designed and high-quality interiors. But the S90's passenger compartment is particularly special. The styling is distinctive, and it's all sumptuous and very pampering. I particularly like Volvo S90 T8's two-tone grey and white steering wheel with the substantial centre hub. The leather used in the interior feels good and gives you a warm welcome. The wood is also top quality, and all materials are used very tastefully. There is nothing forced or overdone about the S90's passenger compartment; it comes across as a naturally nice place to be. There is a lot of space both at the front and back, and most functions including vehicle settings, climate control, navigation, audio system etc. are controlled by the 9-inch touchscreen placed in the centre of the dash. Because of this there are fewer switches. 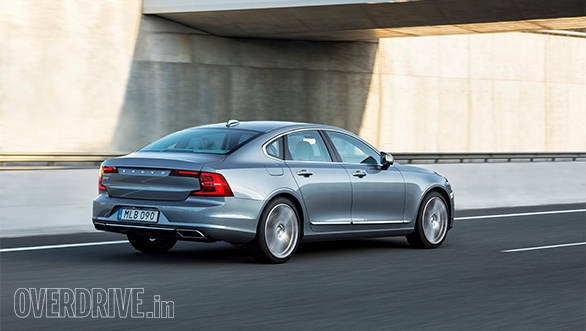 As mentioned the S90 is offered with a couple of diesel and petrol 4-cylinder engines. Most versions are front-wheel drive, but all-wheel drive variants have the more powerful engines. The more powerful engines like the ones in the petrol T6 and T8 are equipped with both an electric supercharger and exhaust gas-driven turbo. The supercharger is designed to reduce turbo-lag and provide torque from low rpm itself. The S90 T8 is the most powerful producing 324PS. The 4-cylinder engines provide more than adequate power, but if you push really hard, you can detect some amount of harshness. The engines also don't produce the kind of sound some of the bigger rival car engines do. All engines come mated to an efficient 8-speed auto, and a plug-in hybrid making over 405PS is also likely to be introduced a little later and will in all likelihood make it to India too. On our drive in Spain we drove the Volvo D5 which will be introduced in India shortly. The Volvo S90 D5 is powered by a 1,969cc diesel engine making 238PS and 480Nm of torque, and it gets from 0-100kmph in 7.2 seconds. The D4 diesel version, which produces 192PS, will also be offered in India. In fact, it might even be launched before the D5. 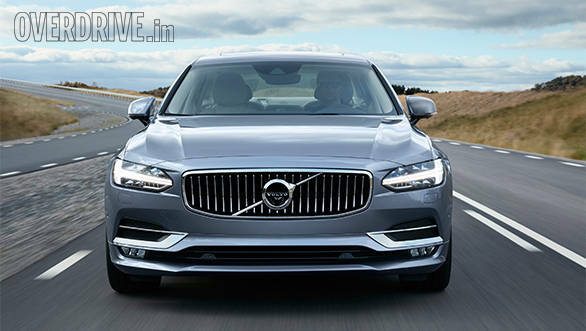 The S90 is a very easy to drive car, offering a very comfortable and cushy ride. The suspension set-up is on the softer side in the interest of ride comfort, and the interior is very silent and the wind noise is remarkably well contained too. Its handling is not as sharp as a BMW and neither will it change direction as smartly as a Jaguar or an Audi. The steering is also light and lacks the kind of feel provided by some of its rivals. But then the focus of the S90 is clearly not sharp sportscar-like handling. Instead it aims to take its occupants to their destination comfortably and safely. 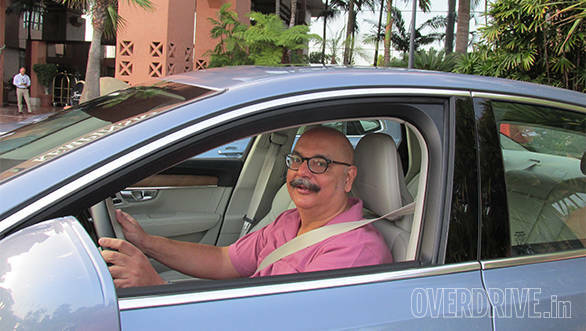 And it is safe because the handling is predictable, and the S90 obediently follows instructions of the driver. The braking is confidence inspiring too. A Volvo would not be a Volvo if it does not feature the state-of-the-art safety technology, and the S90 is no different. It has a semi-autonomous driving feature called Pilot Assist. This system keeps the car in the right lane and even steers on its own. It functions till speeds of 130kmph and includes lane-keep assist, collision mitigation braking systems and adaptive cruise control. 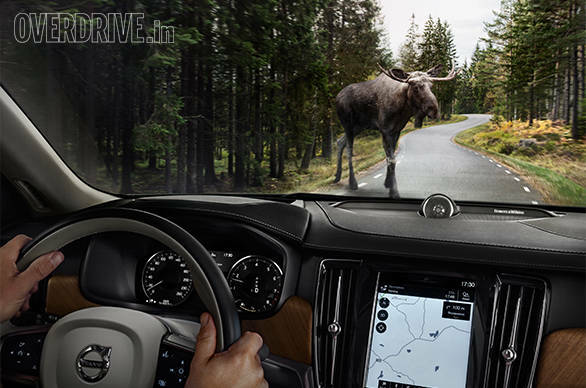 Interestingly, it's also got a feature called "Large Animal Detection with Autobrake". 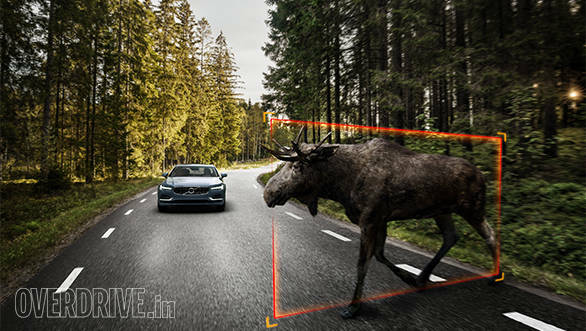 The standard-fitted radar/camera unit on the S90 can detect large animals on the road. If a large animal is detected, the system warns the driver. When the driver brakes, additional brake pressure is provided to support avoidance if needed. In case the driver does not react, the car applies the brakes to avoid an impending collision. In advanced driving conditions like Spain, the Pilot Assist worked fairly well on the motorways which are well marked. The real test of course will be to try it in our chaotic conditions. Volvo does not advise removing the hands from the steering wheel, and Pilot Assist is automatically switched off if the driver does not keep a hand on the wheel. The new S90 is actually a very welcome luxury car. In a segment dominated by the Germans, it's refreshingly different. Its styling stands out as does its interior. 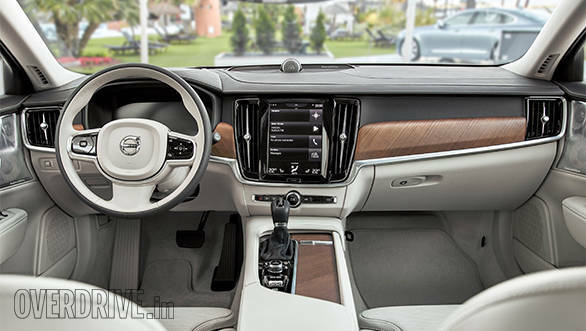 The comfort levels and quality of interiors are worthy of appreciation, and the high-tech safety features that a Volvo comes with make it much more inviting. Given its cushy ride and comforts offered by the interior, the Volvo S90 should appeal to those who are generally driven by chauffeurs.